In a Nushell: What started as a way to feed her family on a single income turned into a charitable initiative to supply food pantries and, eventually, became a successful business for Coupon Mom Stephanie Nelson. Many shoppers are aware of the savings available using coupons for groceries, but they are intimidated by the effort they think shopping with coupons takes. Coupon Mom aggregates available coupons with local ads for grocery and drugstore chains and provides free, well-organized information and educational how-to videos on the savings available. Stephanie’s Cut Out Hunger initiative lives on, encouraging shoppers to use coupons to purchase items that are ideal for charitable donations to pantries and other causes. Stephanie Nelson invited four women to participate in the Coupon Mom Olympics at an Atlanta-area Kroger store. The founder of Coupon Mom gave each shopper $50, and the winner would be whoever ended up with the most value in groceries, with all of the purchases going to charity. 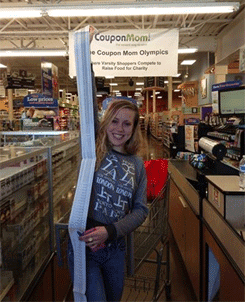 The Coupon Mom Olympics resulted in a very happy winner and more than 1,200 items donated to charity. The winner was a 22-year-old single mother, who worked third shift at a chicken plant in Georgia. In second place was a full-time accountant with an MBA. After the event, Stephanie asked the winner, who bought $800 worth of groceries with $50, where she learned to be such a savvy shopper. The young mother, who walked away with a much-needed Kroger gift card, told her that she watched online videos about saving with coupons. We recently spoke with Stephanie, whose website provides valuable free information on how shoppers can combine coupons with grocery store ads for big savings. Her Coupon Mom website has experienced explosive growth over the years, and Stephanie took some time to explain to us the company’s origins and how she’s planning to use her new resources to continue her charitable mission. Stephanie began her coupon site 15 years ago and has experienced the success that comes with good timing, hard work, and lots of luck. Stephanie Nelson, the founder of Coupon Mom, aims to educate people on how easy it is to save big with grocery coupons. She’s recently added a marketing director, two managers, and a group of college-aged interns to her existing team of work-from-home moms, who do all of the data entry for the site. They moved into a larger office, and Stephanie now has the resources in place to start working on new ideas. Early on in her couponing career, Stephanie identified a key hurdle: Some people just don’t know how to use coupons. Many people think saving money with coupons is complicated and takes too much effort. 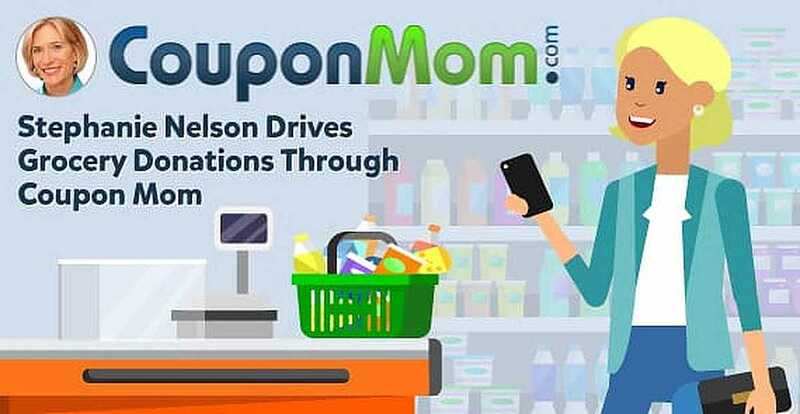 The goal of Coupon Mom, which is a free service, is to aggregate the available coupon and store savings information and make it easy for people to cut their grocery bills in half. Now, Stephanie is taking it to the next level by shifting her team’s focus to a series of easily understandable how-to videos aimed at showing people, especially single mothers or those living on food stamps, how to get the most bang for their buck by using coupons. “We’re developing much more comprehensive tutorial programs that we’re making available for free,” Stephanie said. A Coupon Mom intern recently saved so much at an Atlanta-area Walmart, the cashier owed her 53 cents at the end of the transaction. 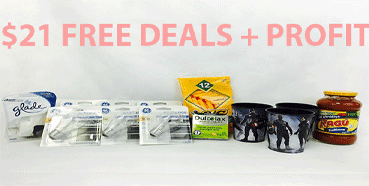 Another undertaking for Stephanie has been developing a blog that highlights some of the great deals available by sending her interns out to test the deals and illustrating just what can be accomplished with the right coupons and information. Recently, a trip to an Atlanta-area Walmart for $21 worth of products resulted in the cashier owing an intern 53 cents. Shoppers who are using Stephanie’s system for free or heavily discounted groceries can take some of those items and pay it forward with charitable donations, which are really the roots of her business. 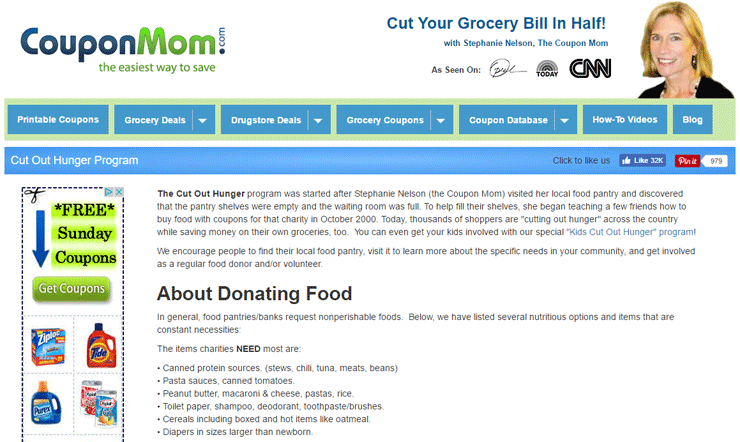 Before the Coupon Mom received her moniker from her segments on “Good Morning America,” her website was called CutOutHunger.com, which is still what she calls her initiative of using coupons to supply food pantries. In 1995, Stephanie had worked 10 years in sales and marketing for Procter & Gamble and Marriott Hotels, when she decided to transition to being a full-time stay-at-home mother. Already an avid user of coupons, her smart spending helped stretch her husband’s salary enough to support their family. Then she discovered that a local food pantry in the Atlanta area had a shortage, and she started organizing to make a difference in her community. Stephanie began organizing all of the information and publishing it on the Cut Out Hunger site to make it easy for other people to save significantly on groceries. Stephanie started the Cut Out Hunger Program as a way of keeping shelves stocked at food pantries. One project she worked on was getting store managers in Atlanta to place special tags on shelves near products that would be ideal for charitable donations and placing a bin near the front of the store to collect donated items. She even taught children at elementary schools to look for the tags so they could remind their parents to donate. Stephanie was making a difference in the Atlanta area. Then a series of television appearances gave her the opportunity to spread her message of coupon savings to a national audience. A combination of media appearances and timing did a lot for Stephanie’s career as Coupon Mom. Over the course of three years (2004-06), Stephanie was featured in 17 segments on “Good Morning America.” In 2008, a major recession hit the U.S., and saving money was on everybody’s minds, including television producers. At one point, she was doing up to three appearances a day on national TV programs. She was even featured on The Oprah Winfrey Show. All of this attention helped her triple her business. Then in 2010, TLC launched a reality TV series called, “Extreme Couponing,” that drew a lot of attention to the concept of saving money on groceries with coupons. “From my perspective, it was the best thing that ever happened to our website, and I wasn’t even in the show,” Stephanie said. Stephanie put her success to good use. 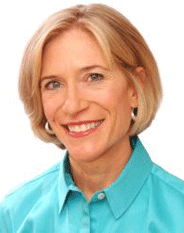 As her company grew, she was able to enlist a bigger staff and take her site national. A bigger employee base also gave Stephanie more resources to start working toward bigger projects such as her charitable outreach and tutorial videos. Like the single mother who won the Coupon Mom shopping competition, Stephanie said the biggest users of coupons are often the shoppers who most need to stretch their grocery dollars. Over the years, the Coupon Mom has received emails from people using her site to learn how to feed their families, despite financial hardships like sudden unemployment. Ten percent of her members are on food stamps and learning new ways to stretch their resources. Stephanie plans to concentrate a lot of her new resources on educational how-to videos that can truly improve people’s lives. Everyone buys groceries, and with websites like Coupon Mom, paying full price can be a thing of the past. And it works for everyone. Customers with limited resources can cut their grocery bills in half and free up money for other essential needs, and higher-income shoppers can also save money and use coupons to contribute to charitable causes.